Outside the Adelaide City Council offices, one morning a few months back, I spied an unusual set-up; wooden couches and a pillar wrapped in butcher paper, with a pen attached for suggestions of what 'happenings' could occur at the southern end of the city, like around Victoria Square. This particular morning I had time to stop and think (for a change) on my way to work, so I added my suggestions to the pillar, grabbed a really good cup of organic, fair trade, takeaway coffee from my favourite little coffee concession, Little Seeds Street Coffee Bar, and turned to see the ChurrOz van to their left. Now, I had no idea what these delicious looking things were. 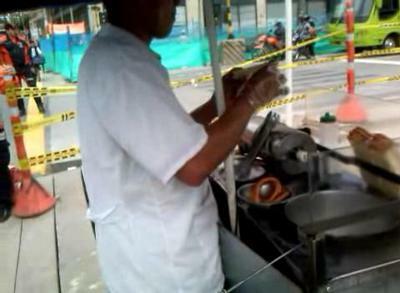 They did, however, resemble straw-like zeppole or Italian doughnuts seen in various cafes around town. As I pondered my coffee, my finances, and what these churro (pronounced chew-row) things were, a man appeared from the side of the van with one of these delights wrapped in a serviette, for me to try. Now, it's not often you get something for free, let alone something as good as this was, but I was also induced to try before I buy. This is a good policy because eight or nine times out of ten you end up buying because you're usually so assuaged with guilt at actually getting something for nothing the you feel the need to purchase the thing you just tasted. I walked off in confusion, with my coffee in one hand and the illicit free churro the other. Oh my God, it was so good with the coffee. I was so tempted to do like the New York detectives and dunk this thing into the coffee, but it would have looked so undignified as I walked along the city byways. I planned to go back and buy these churros with an accomplice; however, days turned into weeks and ChurrOz were no longer there outside Adelaide City Council. Luckily I spotted them, sometime later, the Bikes SA outdoor thingy which was at Hindmarsh Square for a while. This time, I grabbed accomplice and made a plan to get churros again. Accomplice was up for it and off we headed into the city. At Hindmarsh Square we spotted our goal, the ChurrOz van and the haloumi wrap van, so decided to make a day of it and eat it all. This was then washed down with an iced drip coffee or ice infused or whatever they do with it; it's cold and it's good. 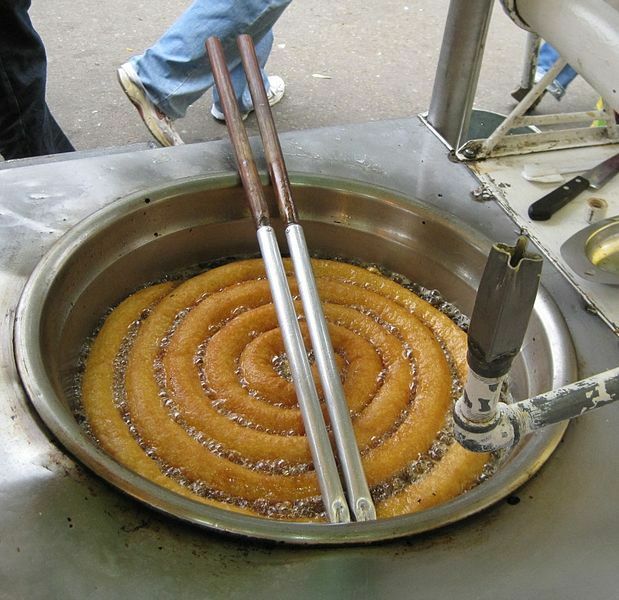 Churros apparently turn out to be very similar to the Zeppola or Italian doughnut, but are, however, an Hispanic invention, and are enjoyed on a daily basis as a traditional pastry snack or dessert, in Spain and Latin America. 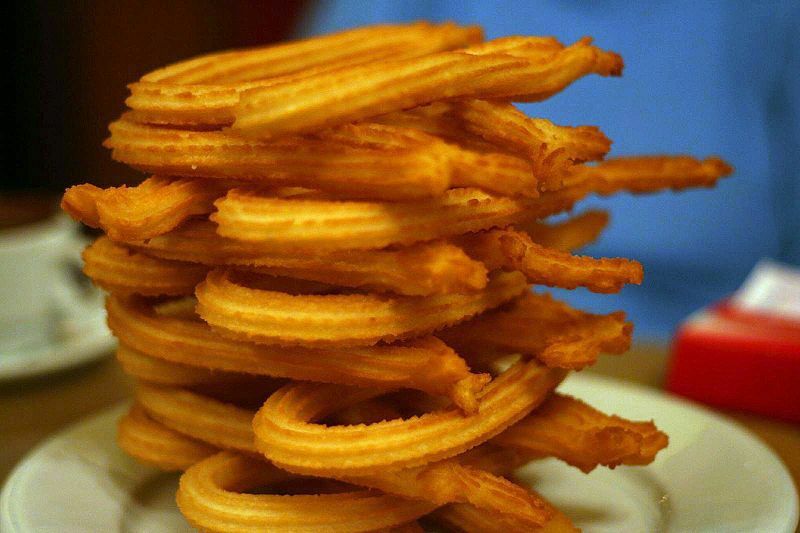 They say that the Churro pastry was named by the Spanish shepherds who looked after the Churro sheep native to the Iberian peninsular region. 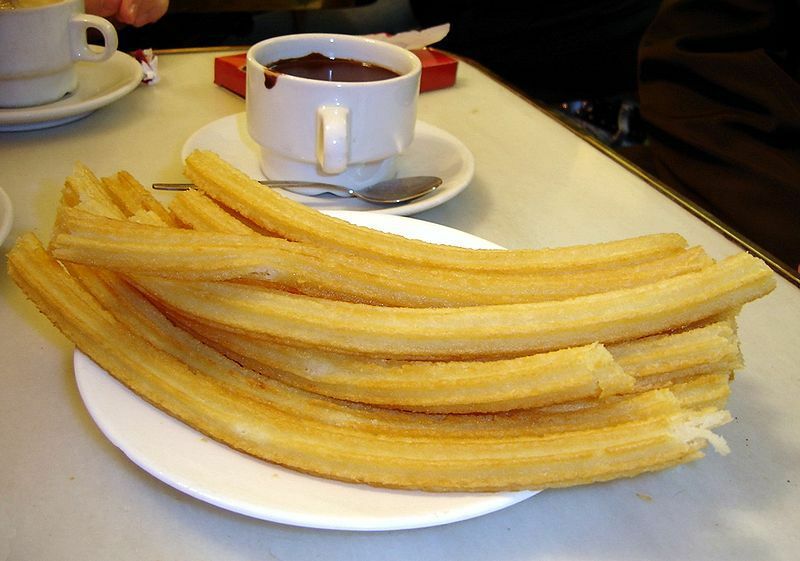 The Churro, was so named because their piped shape resembled similarly, the shape of the woolly sheep's horns, from up high in the mountains, there in Spain. Now, it appears that this little stick of pastry delight is usually served sprinkled with cinnamon sugar, but may also be drizzled with either a warm, creamy chocolate or caramel sauce too. These were what were up on offer at the ChurrOz van. We decided to opt for the uncorrupted version with just the cinnamon and sugar. The chocolate drizzled variety just looked far too decadent, after having already consumed the chicken haloumi wrap from the van next door. What can I say, my introduction to this Spanish delight was probably almost akin to having been invited to coffee with Javier Bardem without Penelope Cruz tagging along. The outside is crisp and firm, with a fluffy,light inside in the middle. The difference between our old cinnamon doughnuts and these is like eating regular pasta and then trying the egg variety. And trust me, because the shape is kind of striated, if you do decide to dunk into your coffee it will hold the liquor really well. It's grooved shape, like a good savoiardi biscuit, will soak it all up. Double delish! Luckily, each serve includes three of these delicious pastries, as one is definitely not enough. Wherever the ChurrOz van shows up next, make sure you get some of what the van has to offer. They are homemade and really good. The ChurrOz van has appeared at many a varied event in the past, like the Gilles St Markets and the Adelaide Roller Derby, but apparently will not be seen as much at one off events these days. To find out where they will appear next, just go to their website or email them on info@churroz.com.au. I'm not usually keen on sweet things like these but you may have seduced me to try them, quite possibly in their most decadent form. 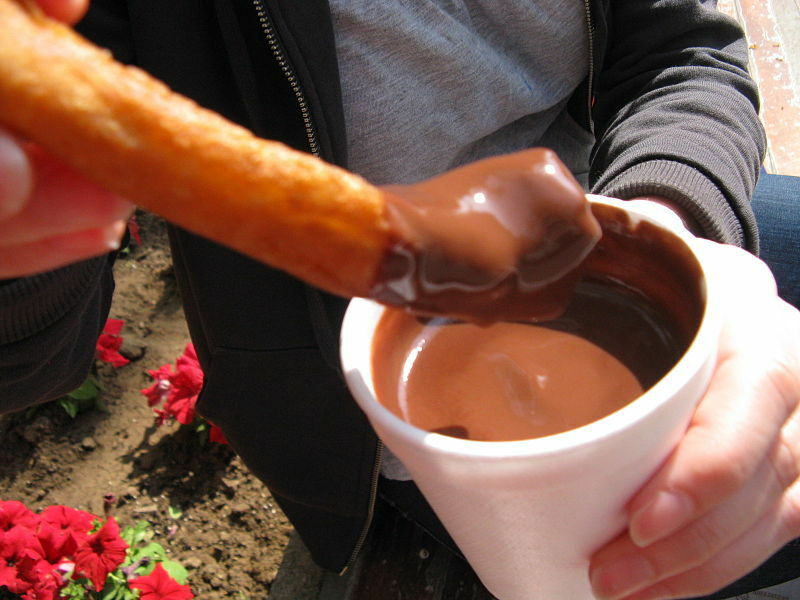 Mmmmm I do like a good churro... that chocolate sauce actually looks really good too, sometimes they can be a bit runny and then you may as well not have it at all. Thank you 'Melbourne Freelancer', glad you appreciated it, as I did your: six things I hated to buy? wasn't it??? And I did seriously consider the mini food processor! Saved by the writer! Go Julie! I'm sure they'd be chuffed to know... so buy 6!!! Doughnut Sticks! What an interesting concept. I've never heard of these treats before, but they sound delicious. They remind me a bit of waffles too. "Illicit churro"LOL this is so funny. It's almost like a Sherlock Holmes case. You've managed to put in so much information along with a great read. Thanks, C&C.